The PGE™ was designed to give operators an alternative to the failure prone phenolic-based isolating gaskets. The unique design of the PGE™ system incorporates patented overlapping and offsetting seal grooves. The purpose of this design is to break each layer of laminate within the gasket itself, thereby creating a barrier through which fluid and/or gas cannot migrate. The sealing element can be any elastomeric material, as well as more sophisticated spring-energized PTFE lip seals. As a result of this advanced seal design, maintenance-free flange isolation and flange face corrosion mitigation are achieved economically. Depending upon the sealing element selected, the PGE™ is rated for most hydrocarbon and water service applications. This gasket is suitable for use in raised-face and flat-face flanges in ANSI Class 150, 300 and 600 service (or equivalent). In addition to providing electrical isolation, the gasket is excellent for isolating flanges made of dissimilar metals or where prevention of flange face corrosion is desired. Dielectric Strength 750-800 VPM Max. The PGE™ is an excellent choice for isolating distribution lines and transport lines for gas, oil and water. The screened version is the best available product for filtering welding slag, rocks, nuts, bolts and other particulates from traveling downstream and damaging valves, pumps, compressors, etc. Because the PGE™ has near zero creep relaxation, it performs well in heat exchangers, applications with high vibration or excessive thermal cycling. SEAL RETAINER The PGE™ seal retainer is constructed from NEMA grade G-10 glass-reinforced epoxy (GRE). This material has excellent performance characteristics with very high compressive strength, high flexural strength, high dielectric strength and low fluid absorption. PGE™ seals made from grade G-10 material are rated for service up to 302° F (150° C). For higher temperature service, grade G-11 is an acceptable alternative material, which is rated for 392° F (200° C) continuous service. Two overlapping and offsetting seal grooves are machined into the high strength retainer in order to break the potential leak/weep path that is inherent in all glass laminate materials. The breaking of the leak/weep path is unique to the PGE™ and truly distinguishes it from all other electrical isolating flange gaskets. PTFE (spring-energized) Recommended for all environments. Helical wound spring provides radial load. Encapsulation in the seal groove eliminates creep or cold flow. This sealing system truly distinguishes Pikotek® systems from all other flange sealing systems. Teflon™ is the most reliable sealing element available. Viton General purpose oilfield elastomer. Excellent resistance to aliphatic hydrocarbons and glycols. Good resistance to aromatic hydrocarbons. Not recommended for: Systems with amine inhibitors and in piping systems containing significant partial pressures of H2S, polar gases (i.e. CO2) or where radical pressure drops commonly occur. Nitrile General purpose elastomer. Excellent for use in water systems or with some aliphatic hydrocarbons, silicone base fluids and glycol based systems. Not recommended for: Systems containing H2S, aromatic hydrocarbons, phosphate esters or halogenated hydrocarbons; piping systems subjected to radical pressure drops or piping systems containing significant partial pressures of polar gases (i.e. CO2). In order to electrically isolate the two flange faces, isolating sleeves and washers are required. To protect your investment in flange isolation, GPT only provides full-length sleeves and double washer sets (i.e. one isolating washer for each end of the bolt). All isolating washers are made of GRE and have a compressive strength of 60,000 psi. Two metal washers are also provided for each sleeve. GPT offers isolating sleeves made from GRE and Mylar. 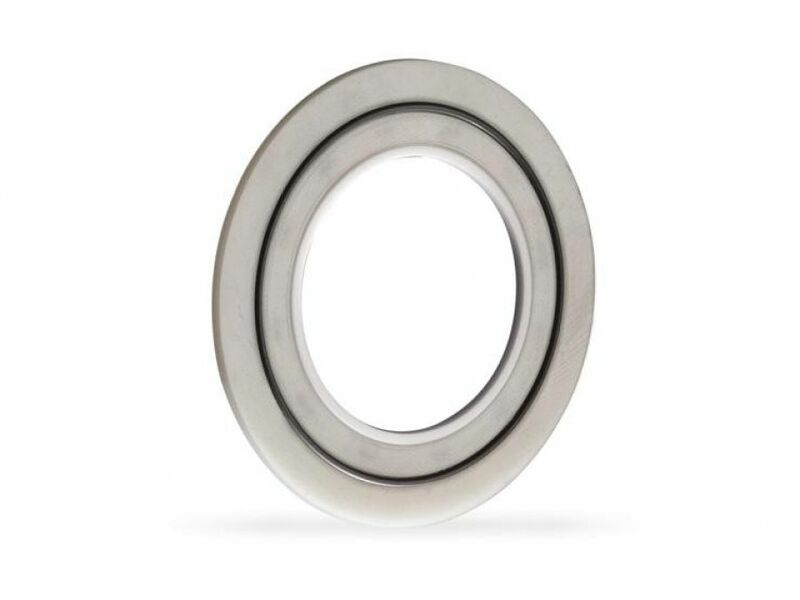 The metal washers are either zinc-plated 1050 carbon steel, stainless steel or HCS washers. Other custom materials are available on request. The HCS washer is the preferred washer selection.